National Picture Book month is celebrated during the month of November. During this time, I like to get out my picture books, dust them off and give them a good looking over. My all time favorites are Hop on Pop and One Fish Two Fish by Dr. Seuss , No David, by Dave Pilkey, There's A Hair in My Dirt, by Gary Larson and Splat the Cat by Rob Scotton , just to name a few. Most of you are very familiar with these famous authors. I would like to introduce you to a couple of up and coming authors. Bio: Rhonda Paglia has been an independently published author since 2013. Her first book, “The Little Lambs and the Very Special Mission,” is dedicated to and was written in honor of the victims of the 2012 Sandy Hook Elementary School tragedy. ALL profits from the sale of the “Little Lambs” book go to the “Angels in Charge Scholarship” for kids from Newtown (CT) High School. To date, $5,500.00 has been donated, and 4 students have received scholarships. Since the release of her first book, Rhonda, is thrilled and honored to have received several prestigious Indie Author Awards. She is a "Moms Choice Silver Award" recipient for her "Meeda and Me" early / beginner reader picture book series; a recipient of the 2015 “Gittle List Top 10 Children's Picture Book Award" for "Grammy's Rockin' Color Rap-a-licious Rap;" and her story, "Three Little Gnomes and a Boy Named Orion," received both a 2015 "Inkspokes Select Book Award" and a 2016 "Readers' Favorite Book Award Winner, Honorable Mention," in the children's general category. Ms. Paglia has authored 10 children's picture books and 2 middle grade non-fiction books. In a former life, Ms. Paglia was an elementary teacher with the Hermitage School District, Hermitage, PA. She and her husband have three grown children, five grandchildren, and a little pup named Bella. "Grammy Pags," as she is now called, enjoys gardening, tap dancing, yoga, and, of course, writing stories for kids! Ms. Paglia is a member of SCBWI, PennWriters, and WestPA Authors. Book blurb / summary: Sprinkle, Dandy Whiskers, and Whisper are bursting with excitement! It's almost time to make their favorite soup, Droppin' Time Stew! But something is terribly wrong in Mr. Joe's garden this year! Every vegetable and fruit they pick up has ONE-BITE-OUT . . . then tossed away . . . like rubbish! Is the Droppin' Time Stew ruined? Who - or what - is behind the "One-Bite Mystery?" And why just "ONE-BITE-OUT?" "Three Little Gnomes and the One-Bite Mystery" is a fall, harvest mystery with a feisty Scottish twist!! When did you decide to become a writer, and why? I tried writing stories when I was a kid. My first "published" story was in 6th grade. It was a feature in our class newspaper, but it was a huge bust. I tried writing other stories in junior high, but ended up completely discouraged! I never wanted to set pen to paper again! However, when my children were little, we wrote and illustrated lots of stories together. They were all early readers! As a teacher, all of my students wrote and illustrated a story as part of our language arts program. (NOTE: I've had the wonderful opportunity to reconnect with several of my former students, who are now adults. They told me they still have the picture book they created in my fourth grade class!) Now that I'm a grandmother, I've written lots of stories with my grandchildren. It's been great fun! Our grandchildren have all been early readers, and they are the ones who have given me courage to share my stories with other kids. What is the inspiration for your story/stories? My grandchildren and life events have inspired my writing, however, the first story I released to the public has its own, very special backstory. "The Little Lambs and the Very Special Mission" was the first book I released to the public - March of 2013. The story is dedicated to, and written in honor of, the children and teachers of the Sandy Hook (CT) Elementary School tragedy (12/14/12/). As an elementary teacher, and former first grade teacher, the Sandy Hook tragedy rocked my faith in our society and struck me to my core. I cried and prayed. It was during my prayers for the children, their teachers, and their families, that I was literally given the "Little Lambs" story. It was "pressed into me." I didn't ask for a story. I didn't want a story, but there it was, and it wouldn't leave me alone. "The Little Lambs and the Very Special Mission" gave me comfort. It gave me hope, andI kept getting this message that I was to share it. I was conflicted, confused, and didn't know what to do, but I stepped out in faith, and decided to go ahead and write what I saw and felt. I'm not an artist, but I illustrated the story to the best of my ability. Through another series of "divine" events, I received help with the illustrations for the hands of God, the Angels, and the Great Shepherd, from Taylor Galaska, a very special 8th grade student. Our local newspaper, The Sharon Herald, found out about the "Little Lambs" story. They wrote a beautiful, full page feature story, and it was then that the "Little Lambs" took wings and began a life of its own. That was in March of 2013. All profits from the sale of this book are donated to "The Angels in Charge Scholarship" for students from Newtown (CT) High School planning a career in elementary education. So far, this little book has generated $5,500 in scholarship money that has been awarded to 4 students. How long does it usually take you to complete a book? It takes me anywhere from 6 months to at least a year to complete a book. The story doesn't take too long to complete - it's the illustration process that takes the most time. If I illustrate my own story, it takes FOREVER! If I hire an illustrator, the start to finish process is still about a year. What is your editing process like? Do you have help from anyone? I use a three step editing process. First, when I get to the point where I think my story is complete, I go back and edit it to the best of my ability. Next, I hand off my story to my husband. He is a professional newspaper editor. Once he's redlined it and I make his corrections, step three is to hire a professional editor. This is the person who makes the final edits and helps ready my story for the public. It's a process! How do you think you’ve evolved in your writing? #1 - I feel that I'm becoming a much better editor of my own books. I do lots of rewrites and editing before I pass my stories on to the "real" editors! #2 - I am really working on saying more with less words. It's a challenge! What have you written? To date, I have released 13 books, 11 are children's picture books, 1 is a non-fiction book on rescue dogs for ages 8+. and one is a reference / travel book on Scotland for middle grade kids to adults. Why did you choose this genre to write in? I don't have a specific "brand" for my books, but I do love writing fun, silly, short, picture book stories for kids - with lots of different topics. One of my favorite characters is the grumpy woozler from the "Meeda and Me" series. Elementary school students have asked me if I would write a chapter book about the woozler. I never thought about writing a chapter book before, but who knows? Maybe that will be a project for the future! I love the woozer!! Is there anything you are working on right now you would like to share with us? I plan to release "Doonsey Returns"- Book #2 this spring. The main character is an adorable little ocean crab named Doonsey. He loves to explore! In book #1, "Doonsey's Beach Adventure, the Great Rescue," his quiet exploring day at the beach becomes a great beach day rescue! He saves the day again in "Doonsey Returns," Book #2! An author that is not new to this game, and is just getting better with all of her releases, both kidlit and adult novels to boot! Tierney James, a former world geography teacher has also served as a Solar System Ambassador for NASA’s Jet Propulsion Lab. Besides living on the Qualla Reservation and attending Space Camp for Educators, she has lived in a mining town where she enjoyed the kind of characters you’ll find in her stories. Having traveled to such places as the Okavango Delta of Botswana, Africa. the Great Wall of China and the castles of Scotland, Tierney expresses her unique experience to create some of her action thrillers. I decided in the fifth grade I wanted to be a writer. My teacher had us create puppet plays then present them to the class. What is the inspiration for your story/stories? When I write a thriller it stems from something that has happened to me or I’ve observed. When I travel I keep a notebook of the sensory overload from being in a new place; smells, food, news, everything I can use later. I’m always on the lookout for excitement and an element that can educate. Even when I write children’s books there is something I want my reader to learn. I usually have read my book between ten and twelve times by the time the book is published. I go through it four times before sending it to my editor. After that there are typically three rounds of edits to address content or just line edits. I hire this done. Why did you choose this genre to write in? I like action packed books, movies and music. Writing thrillers, mysteries and anything under those umbrellas gets me pumped up. I love adventure in my life and a chance to see the world a different way. This turned out to be a good fit. Write every day no matter what! Never give up. Keep a notebook handy for your ideas. It’s okay if your characters talk to you. Or at least that is what I’m told. I love a lot of writers: Nora Roberts, Brad Thor, James Rollins, Sandra Brown, Daniel Silva to just name a few. It is always a thrill to meet someone you have read like Steve Berry, Leo J. Maloney and Steven James. I also enjoyed meeting Ben Coes and Rick Reid. My next author is none other than little ol......ME! . Bio: Willy Robbins grew up in the middle of the Ozarks in Missouri. She was raised on the family farm, where she resides today. Willy grew up with the love of reading, as her first grade teacher, Mrs. Chapman can attest. Willy was the first one to reach the moon that year with the number of books that she read. Reading and writing continue to be an integral part of Willy’s life, she has taught them both for 17 years as an elementary educator. Book Blurb: Brooding School? What? Melba, the newest chick on the farm, is not very excited. Melba wakes up one morning to a new lunch sack, and learns it will soon be her first day at brooding school. The young chick is upset and frightened, but Mother Hen knows just what to do. Encouraging big brother Bert to lend a helping wing to little Melba, pretend school is in session. When did you decide to become a writer, and why? I don’t know that I decided, more like my stories decided for me. I was encouraged a couple years ago to write down my stories, and so I did. How does being a teacher affect your writing? It affects me by having an educational theme in my stories. I just can’t seem to get school out of my writing, as it is a major part of my day to day life. You write what you know...right? I also get to brag that I have books published...some of the kids think that is cool. What is the inspiration of your stories? The inspiration of my stories come from jokes, play on words, or issues in school that need addressing. I am working on a book now about Dyslexia...and more and more it seems like my kiddos that come through my classroom have an increase in this diagnosis. What is your editing process like? I have a girl...just kidding, but yes, I have a wonderful friend, mentor and fellow author, go through my stories. She takes the passive out of my stories, so it doesn’t just lay there between the pages. What have you written? I have two children’s books published, and one more getting ready to be in print soon. 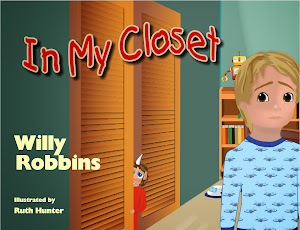 “In My Closet” and “Brooding School Blues” are out and available through Amazon or Createspace. I have been told that you can order them from Barnes and Noble as well. Any advice for aspiring authors? Write. Give us some insight on your main character. Well, being as I have a couple of main characters, I feel they are little heroes, as they overcome some obstacle that might otherwise stop them. They are brave. 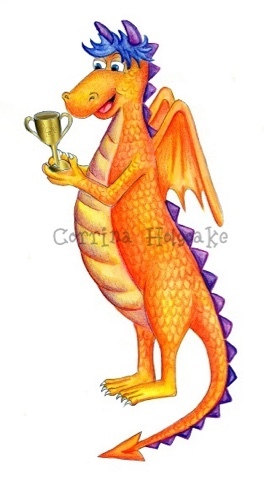 I have enjoyed reading articles and interviews about dyslexia, since my new children's book Nogard the Dyslexic Dragon will be coming out in a couple months. As a Reading teacher, it breaks my heart to see young people struggle with words, whether it is the kiddo struggling to write words or read words. Losing yourself in a fun, colorful book about an adventure, solving a mystery or having that book fly you to the tippy top of the world, should be for every child to enjoy. A learning disability should not stop a child from this wonderful pastime.